The urge to have a beer with “nature’s finest raw materials” is almost certainly not a reason anyone picks Pabst. But it’s supposedly what drew a 37-year-old Sacramento man to purchase some of Pabst’s Olympia brand beer at a store recently. Brendan Peacock tried the brew — which advertises using “pure mountain water,” and whose vintage-style bottles and cans actually contain the words “It’s the Water” — and was upset to find the H2O’s provenance was pretty lackluster. He discovered it’s not from an artesian spring in Tumwater, Washington, as the company suggests, but rather from one of America’s most polluted industrial areas outside of Los Angeles. The Sacramento Bee says that last week, he filed a lawsuit accusing the brewery of false advertising. Peacock’s suit says it’s “unclear where the water is actually from,” but notes water in the Irwindale area (where Olympia is currently brewed) “has been contaminated by industrial solvents in the past.” Olympia, founded in 1896, has made classic American-tough-guy lager for generations. (Clint Eastwood drinks it in at least five of his movies.) The brewery was built by a German immigrant named Leopold Schmidt on the Deschutes River and became an iconic product in Washington state. 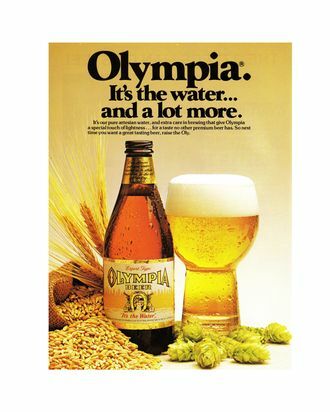 But in 1982, Pabst acquired the company; it shut down the Tumwater brewery years later, and partnered with MillerCoors to contract-brew Olympia at the company’s giant Irwindale brewery. Historically, Irwindale’s water has been a problem. Today it’s supposedly free of chemicals, but around the time Pabst took over Olympia, the underground aquifer that supplies 90 percent of San Gabriel Valley’s drinking water was declared America’s largest Superfund site by the EPA. Decades’ worth of dangerous chemicals had leached in from nearby Cold War–era bomb-making factories. The government found trichloroethylene (a degreasing agent linked to cancer and liver damage) and perchlorate (a rocket-fuel component and “likely human carcinogen”), among others. A cleanup effort was undertaken, but MillerCoors still mines its water — reportedly several hundred million gallons a year — from this source. Peacock says if he’d known any of this, he’d have avoided buying Olympia. A self-described “beer, and craft beer, consumer,” he’s brought false-advertising suits like this before: He filed a class-action recently against the brewery 21st Amendment too, alleging it was duping consumers into believing all of the brewery’s beers are made in San Francisco, when some actually get brewed “in an ‘old [Minnesota] brewery known to make kind of crappy beer.’” 21st Amendment agreed to settle that case, though the terms are unknown.